But there was truth behind that statement. 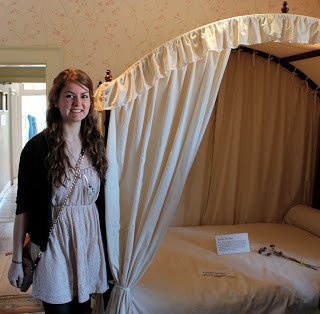 Visiting Jane Austen’s house has been the Number 1 item on my bucket list for many years. Today I crossed it off. I decided to do something special for my 21st birthday (well, the day before, but it’s close enough). I had always known that I’d be celebrating my entrance into adulthood in London, but I was never exactly sure how I would celebrate it. The typical American 21st birthday involves quite a lot of alcohol, a shot book full of embarrassing pictures from friends, lots of laughs and crazy antics and maybe, if you’re lucky, coherent memories of that night. I’ve never wanted that. Luckily, going to England gave me a chance to celebrate this milestone birthday my way. 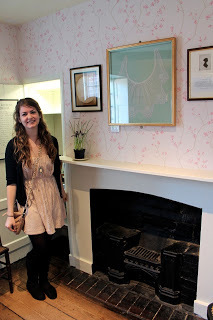 I decided to make this birthday one to remember by visiting the home of a woman who was more accomplished at 21 than anyone I can think of : Jane Austen. 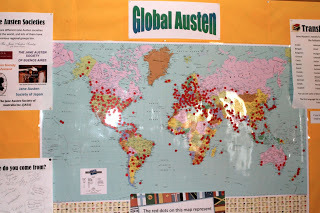 Jane Austen is so much more than my favorite author. Although she is not living, she has had a monumental influence on the way I approach the world. Jane drew from her own life experiences to write about what she knew, which was a world where marriage was the end goal of all female life. But Jane, unlike other women, saw through this superficiality and was able to critique it with a maturity beyond her years. Jane taught me that the everyday happenings in life give us meaning and make us who we are. That little things do matter. And in my darkest days, it has always comforted me to know that little things do make a difference. That although life seems “but a quick succession of busy nothings,” it can be gone too soon. You’re right, Jane. Why not? 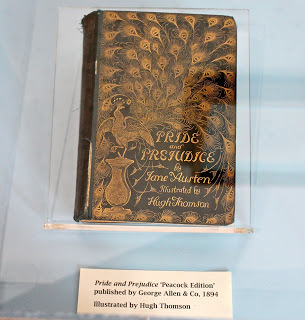 At the age of 21, Jane had already written the first drafts of Pride and Prejudice, Sense and Sensibility and Northanger Abbey. (So yes, what am I doing with my life?) She is known for constructing the first great novels with plot development, well-rounded characters and her trademark cynicism and wit. 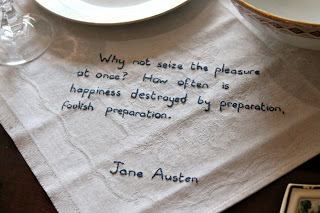 With her maturity, snarkiness and insightful observations into life, Jane has become my literary hero. It’s only fitting that I mark a milestone birthday with a visit to her house. Today was everything I ever hoped it would be and more. I woke up with feelings of both excitement and sadness. Before I left for my first ever concert when I was in elementary school (yes, it was Britney Spears), I remember telling my mom that I felt really sad. Knowing that something I had been looking forward to for so long would soon be over caused a pang in my heart. That’s how I felt today. Of course, all of the excitement surpassed these feelings and I couldn’t wait to finally step foot into my own personal Mecca. 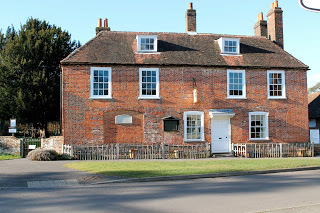 Jessica and I started the day off early and took the train to Alton, which is the town neighboring Chawton, where Jane’s house is. The train journey took about an hour and 45 minutes. If you think the path to her house is clearly marked, you’re unfortunately mistaken. 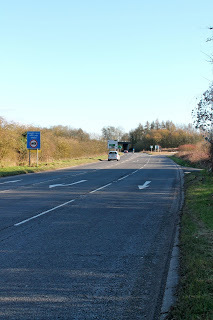 The walk from the train station to her house takes about 40 min at a solid pace and is along unpaved grassy roads next to a busy highway. 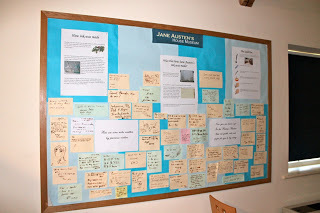 Our journey was very true to Elizabeth Bennett’s trek across the countryside to visit her sick sister Jane in Pride and Prejudice. 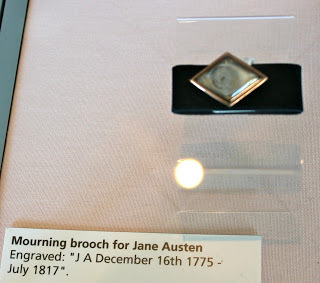 It was then that Elizabeth arrived with her hair “so untidy and blowsy” and her hem “six inches deep in mud.” Of course, I was wearing a dress and my favorite cameo jewelry for the occasion, so I knew exactly how Elizabeth felt. 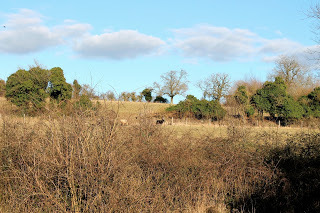 We walked past grazing cows, street signs for roundabouts and wild flowers. The same unmarked paths Jane once walked on during her long afternoon walks with her beloved sister Cassandra. Although the trek was far and muddy and we weren’t always certain that we were headed the right way, we did manage to find our way without any wrong turns. 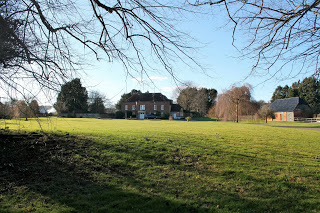 Finally, Chawton. It is more pastoral than any place in England I’ve visited thus far, and it is the most beautiful place I have been in all of my life. It is the place that will forever hold my heart. It’s very surreal to stand in front of the very thing that has been your desktop background, screensaver and/or Facebook cover photo for years. 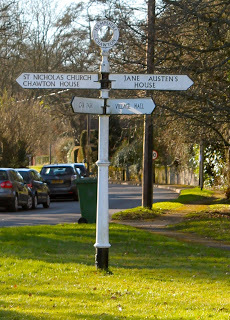 All of a sudden, Jane’s house was right in front of me. My heart swelled up and I couldn’t help but smile bigger than I have in a long, long time. 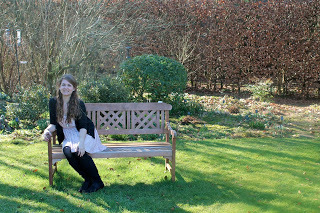 We first had a mini photo shoot in the gardens of her house, which were not yet in bloom, but still shining brightly in the sunlight. We then made our way inside of her house. 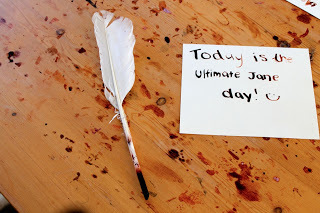 The first thing I did was practice my quill writing with ink, which is so much harder than it looks. The ink blots very quickly. 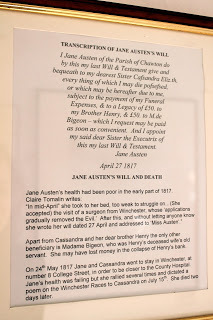 Jane must’ve been a very patient woman! No wonder Jane loved it here! 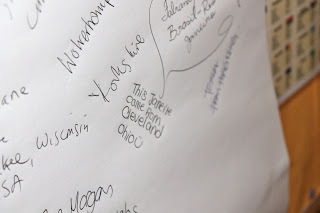 I then signed the first of many guest books in the house. I was the only person who wasn’t from England to sign the page that was opened. In the comments section, I wrote: “I’ve been waiting years to come here. I’m so happy to finally meet you, Jane.” The elderly woman who was attending the book gave me a kind smile and pat on the back. I think she knew what this meant to me. Of course I left my mark! Jane, you could’ve never known how many people would come to see your house. Any Janeite would be proud of the museum. I was amazed at the extent of the collection. It was filled with many of her clothing items, jewelry and letters. 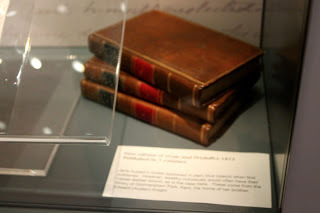 This was also the perfect year for me to come because it is the 200th anniversary of Pride and Prejudice, which means the museum showcased original manuscripts and illustrations from the novel. 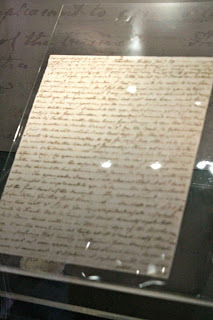 Letter from Jane to Cassandra when Pride and Prejudice was published. She described it as her “own darling child.” How sweet is that? 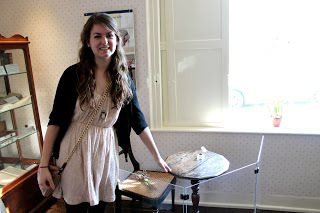 The ultimate highlight was when I touched Jane’s writing desk (even though I wasn’t supposed to). It was smaller than I thought it would be. Every morning, Jane woke up and hunched over that very desk to make my favorite worlds come to life. As her ink stained the pages, Mr. Darcy professed his love to Elizabeth, Emma flattered herself and Fanny Price timidly watched the world pass her by. Centuries later, I stood at the desk where this magic was written down and experienced what is sure to be one of the happiest moments of my life. The feeling of being connected to a woman I so deeply admire. I don’t have words to describe what this felt like. I took my time and read every detail on every placard and appreciated every insight provided by the historians. 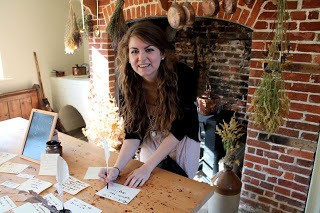 I pretended to churn water, wrote with ink and a quill and touched the walls where Jane spent her days. My heart hurt when I read about her final moments on earth before she died at the age of 41. But the museum was incredibly uplifting and positive. It was simply magic. She left almost everything to her beloved sister, Cassandra. I must say that Jessica was the perfect person to go with. She was patient, took endless pictures of me (and Mr. Darcy) and pointed out highlights she thought I would appreciate before I got to them (because I was moving pretty slowly). 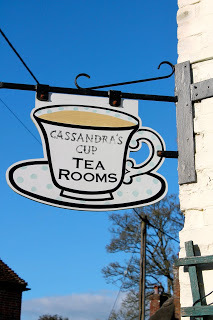 She also treated me to tea and cake for my birthday at Cassandra’s Cup, which was a teashop directly across the street from Jane’s house! 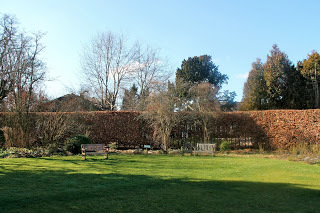 The feelings of sadness began to creep up as I knew the end of my visit to Chawton was approaching. After all, how do you voluntarily end a day that you’ve looked forward to for years? Luckily, I am taking Jane’s best legacy back with me: the minute particulars. Today was full of monumental particulars, and every moment will remain with me. Many people have commented on my pictures saying how happy I look. It’s true, I have rarely felt happier than I did today and I guess it shows. And a day to always remember. As we left, we returned to the muddied path, this time knowing the way, and this time a little sadder. I have checked an item off my bucket list and it feels incredibly satisfying to know that I made it to England and to my top destination. This visit made me love Jane even more (if that’s possible). 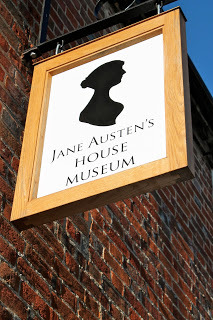 The Jane Austen Museum claims to be home of England’s Jane. 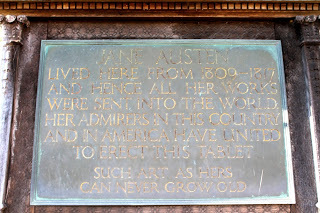 This is true, but it’s also home of my Jane, too. Here’s to turning 21 and a birthday I’ll never forget.